The Yellow Slug (Limacus flavus) was first recorded in the UK in 1884. In the 1970’s a second similar looking species was recognised, first in Ireland then spreading quickly throughout the UK, the Irish Yellow Slug (Limacus maculatus). Since then, records of the Yellow Slug have declined sharply. Are we about to witness the extinction of a slug in Britain? We need your help to find out. Both these slug species are known to be detritivores, feeding on decaying plant material in gardens. They are not considered plant pests as they do not feed on live plant material. The RHS is currently conducting a Slug Hunt as part of a PhD project with Newcastle University. 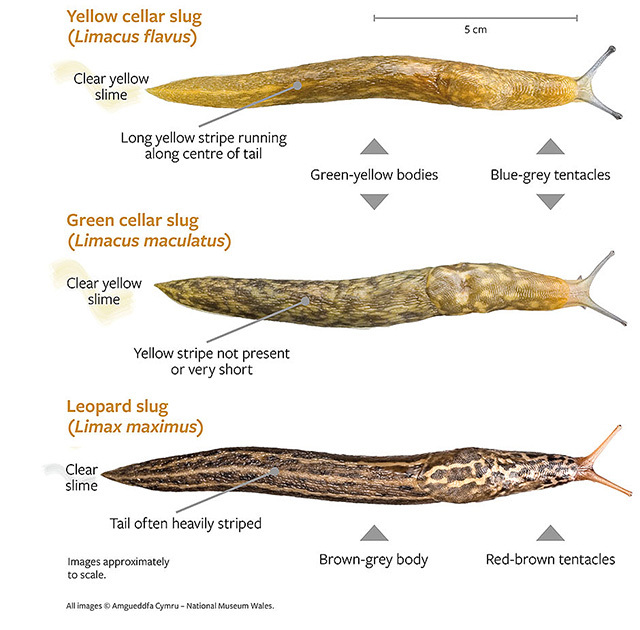 The overall aim of this project is to identify which species of slug and snail are present in UK gardens, which are causing damage to plants, which may be beneficial, and their abundance. The results of the project will be communicated back to survey participants and published on the web and in horticultural media for the public. It will also be used to improve the advice the RHS gives to the public. Grab a torch and go on a slug hunt in your garden after dark to see if you can find this nocturnal species. You can also find these sociable species resting underneath logs, paving, in drains and under other objects during the day. Here they form characteristic ‘huddles’ thought to help conserve moisture. Your records will help to document our changing wildlife.